Losses associated with temperature lapses in the pharmaceutical supply chain are estimated at $320 billion globally, a number larger than the combined market valuation of Visa, Intel, and Walmart. Plainly, reliable supply chains are critically important for the profitability of the pharmaceutical industry and for the safety of consumers. While the medical professionals who administer pharmaceuticals are aware of how sensitive they can be to temperature changes, warehouse workers may be less familiar with the delicate nature of drugs. Their main concern, after all, is getting pharmaceutical products delivered on schedule, and the hectic pace of a warehouse means that lapses in procedure can go unnoticed. For this reason, good warehouse practices in the pharmaceutical industry are imperative. Clearly defined procedures and responsibilities are key to ensuring that biologics, drugs, and other pharmaceuticals arrive ready to be used. Fluids: The presence of unidentified moisture could indicate that packaging has been damaged and the drug is leaking, or that it has been exposed to fluid that could cause the pharmaceutical packaging to be compromised. Odors: Chemical treatments or cleaners can interact with pharmaceuticals even when there is no direct contact and the amounts involved are very small. Tylenol shipped on wood pallets that had been treated with a banned chemical took on a moldy odor and caused gastrointestinal distress in users, forcing a massive recall of the drug in 2010. Unusual odors may indicate that a shipment of pharmaceuticals is no longer safe. Spillage: Loose medication in the form of pills, doses, or blister packs indicates that a load of pharmaceuticals packaging has been compromised and the safety of the load is suspect. Signs of Pests: Insects or rodents can use shipping materials like wood pallets and boxes as shelter or nesting material. Since pests of this type can carry diseases, indicators of pest activity like scratches or feces means that a pharmaceutical shipment may be compromised. Temperature: Vaccines and other biologics, as well as antibiotics like amoxicillin, must be kept cold in order to retain effectiveness. During transportation, the correct temperatures need to be constantly maintained and temperature tags checked on delivery to ensure that pharmaceutical shipments are still safe. Pharmaceutical storage should be clean, dry, and—for certain pharmaceuticals—cold. Keeping cold storage facilities clean is made more difficult by the fact that atmospheric moisture condenses as temperatures cool. Moisture can condense on horizontal surfaces and damage product packaging, provide a growth medium for microbes, and make cleanliness tougher in general. Providing coats, gloves, and other personal protective equipment will help employees stay warm when assigned to cold chain areas. Good warehouse practices for pharmaceutical cold storage start with ensuring the door to the cold storage area remains closed at all times to prevent moisture from entering. It’s also a good practice to ensure workers know that it is not a suitable break area and that they should not bring food or drink into cold storage. In very cold storage facilities, warehouse workers may be tempted to open the door to warm themselves up. Providing coats, gloves, and other personal protective equipment will help employees stay warm when assigned to cold chain areas. The fact that something as simple as leaving a cooler door open can ruin expensive pharmaceuticals illustrates how vulnerable the industry is to human error. For this reason, if your warehouse handles and stores many pharmaceuticals, reducing your reliance on human intervention can pay off immensely. Switching to an alternative shipping platform can provide the reliability required for an ASRS to operate smoothly, and can be beneficial overall for a warehouse handling pharmaceutical products. 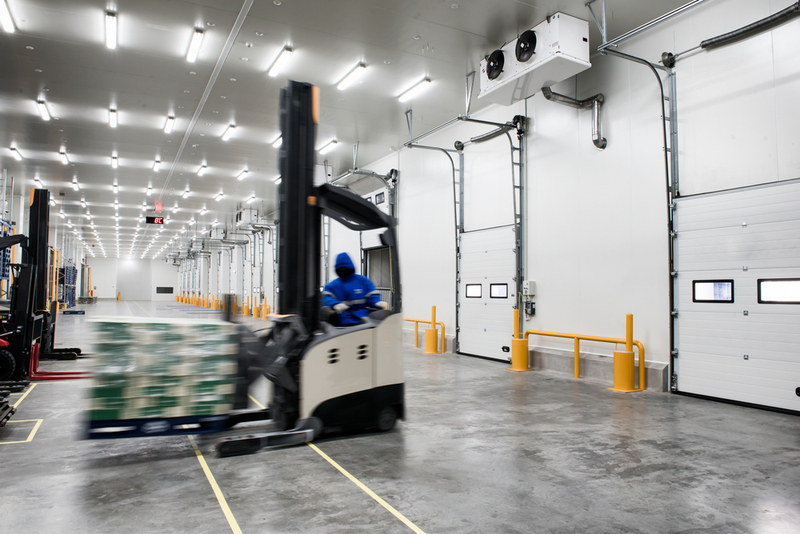 An Automated Storage and Retrieval System (ASRS) can be situated entirely within the cold storage area, reducing the number of door cycles between warm and cold areas. This stabilizes temperatures, reducing energy costs and the risk of product damage. An automated system doesn’t have to take breaks to warm up or for any other reason, increasing pick speeds and overall throughput. The biggest disadvantage of an ASRS is that it requires consistent, predictable input to achieve peak efficiency and remain in operation. This is a problem for some supply chains because the wood pallets that pharmaceuticals often ship on at the load unit level aren’t uniform in dimensions, weight, or condition. Switching to an alternative shipping platform can provide the reliability required for an ASRS to operate smoothly, and can be beneficial overall for a warehouse handling pharmaceutical products. Plastic pallets are reliably consistent in weight, size, shape, density, and durability, unlike wood pallets, making them ideal for pharmaceutical product transportation and allowing companies to make the most of supply chain automation. Plastic pallets won’t absorb moisture, whether it’s atmospheric or condensed, and are easy to clean and sanitize. This makes them an ideal platform for use in an ASRS and a good way to improve warehouse practices in the pharmaceutical industry. Discover more about how the durable iGPS plastic pallet helps support good warehouse practices in pharmaceutical and other industries by giving our team a call at 1-800-884-0225, emailing a specialist at switch@igps.net, or visiting our contact page.